The September-October issue of FGBC World has been mailed to churches and subscribers. 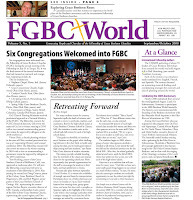 FGBC World is an all-Fellowship, all-Grace Brethren newspaper that is published six times a year. In its pages you will find stories about the Grace Brethren family around the world – from individuals who are on the front line of ministry to organizations that help impact lives for Jesus. This issue contains news of the recent FGBC conference, photos from both Momentum conferences (the annual Grace Brethren youth conferences), and other stories about people in the Fellowship.